Awfis provides ready-to-use, plug-and-play workspaces that can be booked through its mobile app in real time. Startups and SMEs — and even individual professionals and bloggers for the matter — are warming up to the idea of collaborative working, which allows them to share not just physical space with peers, but also to engage actively for cross-pollination of ideas. And with rapid urbanization, burgeoning traffic and increased travel times, ‘anywhere workspace’ has become all the more important. While there are many co-working spaces available in the country, SMEs and startups often face challenges of discovering office spaces with decent infrastructure at cost-effective rates, in real time. “The problem could have been solved to a large extent, had the real-estate industry adopted the shared-economy model that will allow consumers to utilize their space on a just-in-time and flexible basis. But the trend has not taken off in India yet,” says Amit Ramani, who aims to bring in change with his co-working space booking platform Awfis Space Solutions. Ramani — a veteran in the design management, workplace and business process improvement and facility planning — launched Awfis, with an aim to help users discover new-age, technology-enabled workspaces across the country. “We felt the commercial real-estate market still operates in an archaic fashion, with spaces offered by developers and conventional business centres requiring long-term commitment and upfront deposits, resulting in SMEs and startups unable to find quality office spaces at accessible locations,” says Ramani, who founded the startup in July last year with a seed investment of US$10 million. According to him, the shared-economy ecosystem is driving the consumption of various services, including cabs and hotels by connecting under-utilized assets (supply) with just-in-time users (demand). “The birth of Awfis was driven by an unrelenting desire to provide quality workplaces at best locations on a just-in-time basis,” he explains. Based in Mumbai, Awfis provides ready-to-use, plug-and-play offices across different cities that can be booked through its mobile app, available on Android and iOS. A user can choose his/her favorite space for an hour to 11 months, without the complications of a fixed tenure or security deposits. Private cabins and meeting rooms can be booked on a just-in-time basis. The rent is decided based on the kind of inventory and the services on offer. Awfis has created different packages targeting individuals and groups with different needs, aspirations and wallet sizes. Its offerings range from flexi seats to fixed seats to cabin seating, in addition to meeting rooms at both its centres as well as third-party locations (hotels such as Marriot, Royal Orchid, Red Fox, Trident, Hyatt). Its offered prices are inclusive of add-on services like high–speed Internet, printing, F&B credits, meeting room credits, housekeeping and technology support. Awfis currently manages around 2,400 seats across 10 operational centres, and it has a community of over 1,200 active members, claims Ramani. As of now, it manages and operates its own centres across Delhi, Bangalore and Mumbai. In addition to taking spaces on straight lease, Awfis is also ‘uberising’ real estate and is working on a managed aggregation model. Unlike a P2P aggregator (like AirBnB), in managed aggregation, Awfis infuses funds for lease improvements, runs the operations, and manages the customer experience at the aggregated spaces as well. “We are providing solutions for monetizing under-utilized commercial spaces, including spaces lying vacant due to softened demand, shadow vacancies, excess capacities, dead zones (uneconomical sizes),” he says. Ramani says that startups, freelancers, independent workers and SMEs have been using Awfis centres as their primary offices. A number of corporates have also signed up to set up small satellite locations. 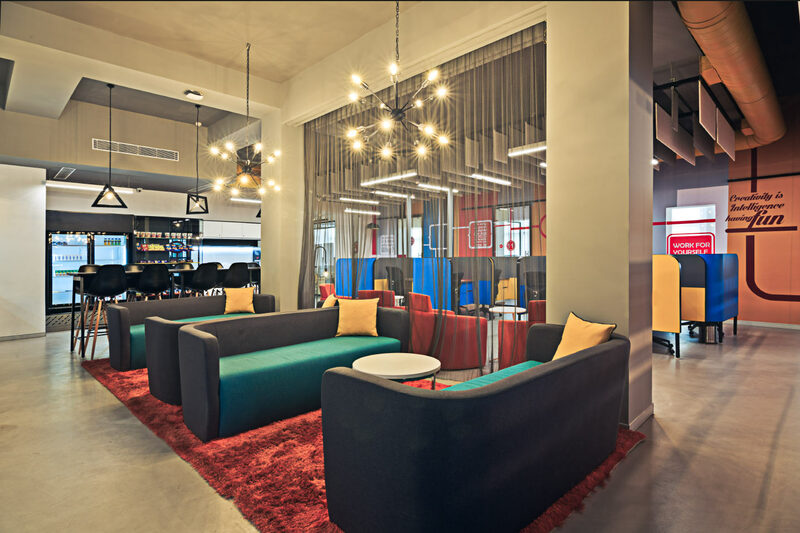 He observes that co-working has caught the imagination of the Indian working professional in a big way. The rapid pace at which entrepreneurship, independent working and freelancing have grown has presented excellent opportunities for the co-working industry. “In terms of employee head-counts, startups and SMEs are scaling at a much faster rate than before making their space requirements more fluid and ever–changing. Co-working spaces provide them with the flexibility of acquiring space as per need and not invest in property in anticipation of future demand,” he concludes.